A few days ago I picked my new running watch which incorporates a GPS (1). The previous one, a Garmin 405 Forerunner was a present from Jaime and Luca back in the Christmas period of 2010 to 2011. In just half a year I lost about 20 kilos and completed about 900km. Never before I had run so often so constantly. It helped me to run firstly slower focusing on the heart and then faster focusing on the pace. It helped to introduce tempo and series sessions in the training. In these 5 years, wearing the watch almost at every run (2), pacing myself with it, making numbers in my head about rhythms, times, kilometres, etc., I have completed over 9,000 km, more than 50 races, including 10 marathons and 2 ultras. Since the last summer it started to work faulty. Sometimes it switched itself off, it re-started by itself, it didn’t recharge the battery well… The last time it recorded well a complete activity was on October 29th, when we ran together 7km, just 4 days after having completed the Toulouse marathon. Maybe it needed more time to rest. (1) A Garmin Forerunner 220. (2) Except for having for some times in which I forgot it or its battery went out. 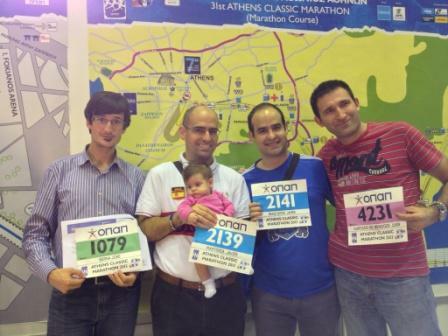 I heard about the modern Athens Classic Marathon from Antonio, a colleague at the office. Ever since, I had wanted to take part in it. Last week, two friends (Jose and Juan), my brother and I completed it. In a previous post I wrote about the legend of Pheidippides and the origin of the modern marathon. In this post I will focus on my experience and will share some of the pictures that we took during this trip. Volume of kilometres run per week. To prepare for this marathon I followed a 16-week training plan provided by Garmin (Level II). Each week it included between 4 and 5 days of running and often 1 day of cross-training. I fulfilled most of the plan, missing not more than two or three days of running and some more of cross-training. I did not skip any series session or long run. 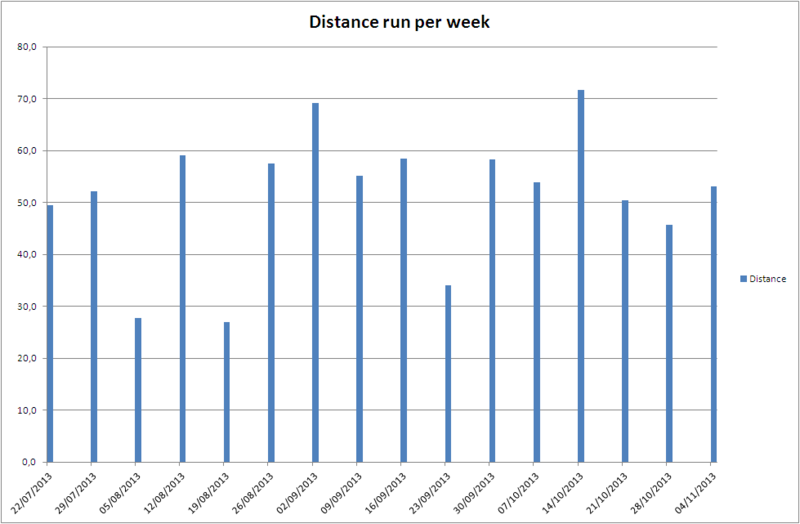 In all, I ran over 780km in those weeks, excluding the 42km of the race (an average of just over 50km per week). During this training season I beat my 10k and half marathon personal records. I had not experienced any serious injury that prevented me from training during whole weeks or months as it had been the case in previous years. According to a running calculator that I use sometimes, had the race been in similar conditions as those 10k and half, I should have been around 3h30′. The profile and conditions were not the same, and despite of that I started with a pace towards 3h30′ just to see how far would I reach maintaining it and if I could be under 3h45′, thus achieving a new PR. The day before the race we went to the marathon expo which was held at the Taekwondo pavillion of the 2004 Olympic Games held in Athens. This way we also visited the beautiful small port at Piraeus close to Faros (just past the Stadio Eirinis & Filias, where Olympiakos bastketball team plays). As I mentioned in the previous post, the race goes from the village of Marathon to Athens, replicating the route followed by Pheidippides to announce the victory of Athens in the Battle of Marathon. 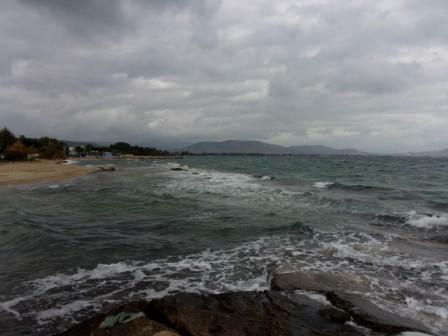 The Persians landed at the bay of Marathon in their attempt of invading Attica, thus Marathon is almost at sea level. 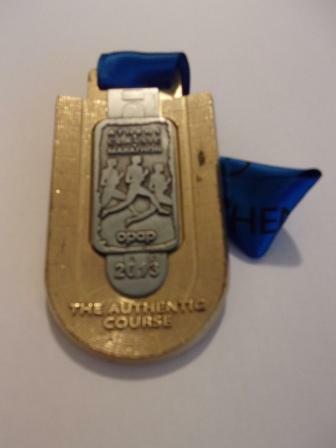 From Marathon, the race goes South more or less parallel to the sea-line for about 17 kilometres and then heads to the West to climb up the hills before the valley where the city of Athens is located. 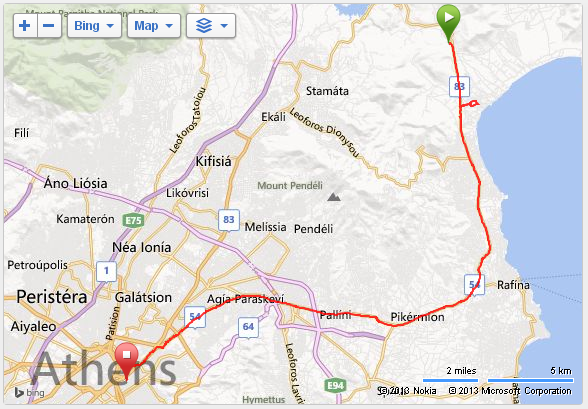 Route of the Athens Classic Marathon. 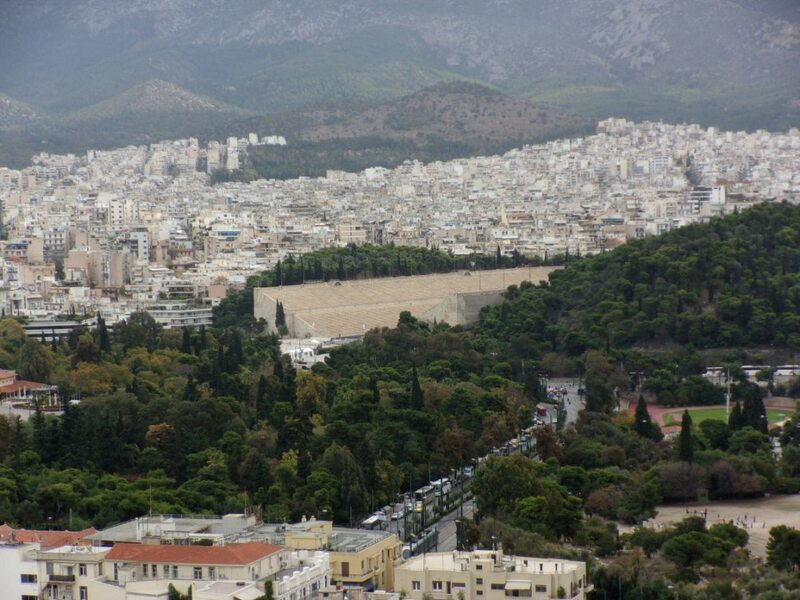 The last part of the race is a descent from the hills to the centre of Athens where the Panathinaiko stadium is located. But by then, the damage is already done to the legs after a long climb. 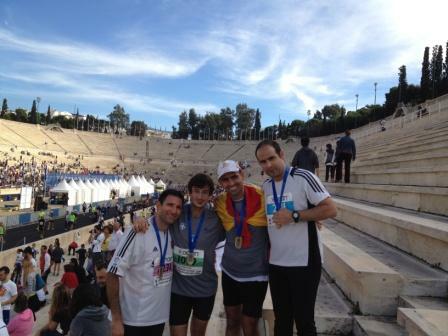 Profile of the Athens Classic Marathon. The morning of the race, we were transported from Syntagma square to Marathon by dozens of buses early in the morning to be able to start at 9:00. Everything ran smoothly (in that and many other aspects the organization of the race was superb). We changed clothes in Marathon, where we could take some pictures, go to the toilet, warm up and slowly get into the racing mindset. WC panoramic view (at Marathon, picture by Jose). We took one group picture and set for the departing line. The week following to the race I went back to Marathon to visit the place with time and see the different spots (some of the pictures in the post are from those other days). 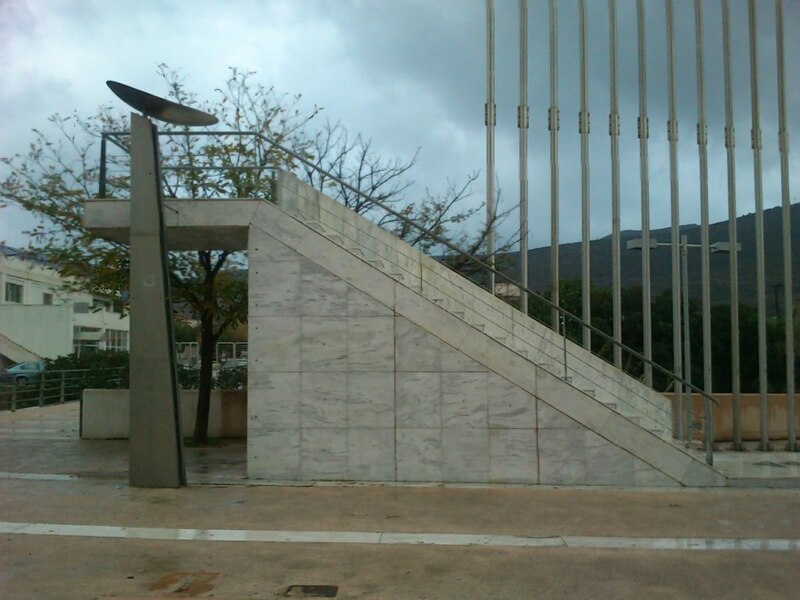 In the village of Marathon there is a small athletics stadium at the end of the national road from Athens to Marathon. The 1896 Olympic marathon race started at “… the brigde at Marathon Plain”, or “… at the bridge near the entrance of the sacred city”, according to “Olympic Games 776 B.C. 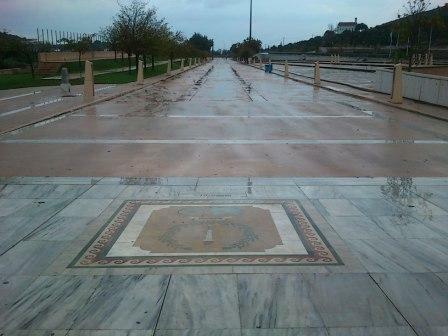 – 1896” by A. K. Bech, or “… The starting point will be at the 40th stadion on the Marathon – Athens national road”, according to the Athens daily “Olympia” on March 9, 1896 (as can be read in the milestone below). 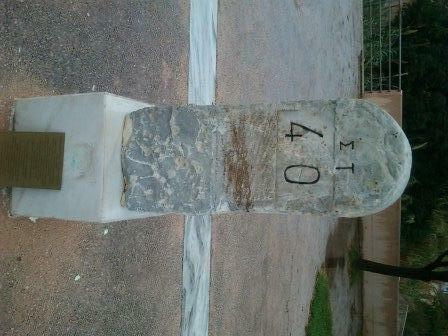 That point, the “40th stadion” of that national road, is marked by the milestone below. Today, the Athens Classic Marathon starts a bit ahead at the mid-point of what is now a kind of majestic avenue at the beginning of which one can find a marble stone indicating the starting point of the olympic race, a milestone indicating that 40th stadion, and the tower where the Marathon Flame is lit after being brought from the Marathon Tomb (just 5km away). 2013 Boston marathon memorial bracelet. Just before the race start we observed 1 minute of silence for the victims of the attack at the Boston marathon earlier this year. This minute counted with the presence of president of the Boston Athletics Association. That was the 3rd such minute I had observed as during my honeymoon trip I had taken part in two races in the USA, in San Francisco and San Diego, from which I got the memorial bracelet that I wear often lately. At 9:03 our group departed and there we went my brother and I trying to pace ourselves at a bit less than 5′ per km. That was comfortable for the flat part at the beginning. Another positive point of that beginning: with less than 10,000 runners taking part the running was possible from the start. 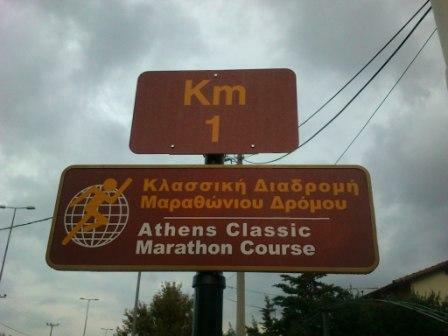 Milestone of the km 1 of the Athens Classic Marathon Course. The course of the marathon race is marked, not only by ad-hoc signals for the race, but by permanent posts along the road, such as the one of the picture for the first kilometre. At about the km. 5 the course takes a small detour from the national road to round the commonly known as Marathon Tomb, or Marathon Tumulus, a park with a small hill where each year the Marathon flame is lit. 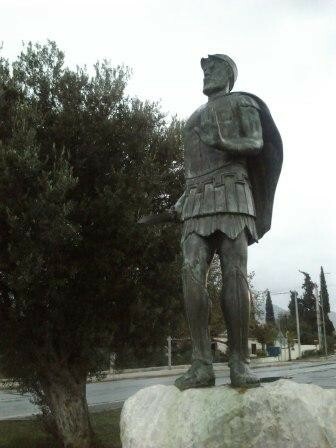 Close to the park entrance, there is a small statue of Miltiades, credited as the one devising the tactics to defeat the Persians at the Battle of Marathon. 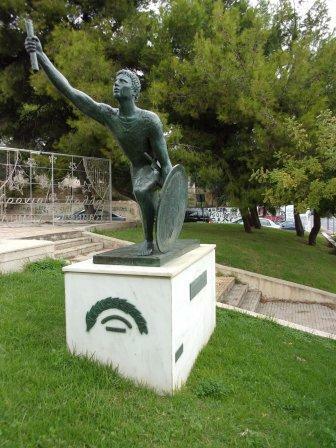 Statue of Pheidippides km. 18. 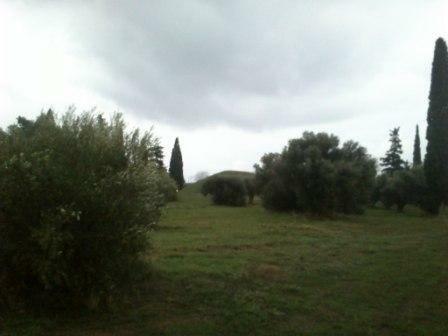 At the return from the tomb, already 6km had been passed. The road continued to be flat until about the 11th km, where the road started to pick up until km. 16, where there is a short and steep descent up until km. 17. At the km. 18, there is a small statue of the legendary Pheidippides. From then on the road continues to climb more or less continuously until km. 31. Up until the 20th km I was still at the pace of 3h30′, but in the beginning of the climb I was already feeling that it was going to be very tough to run kms at below 5’50”. I have checked the Garmin records afterwards and I had already surpassed 167bpm at some points by the km 20th, which experience tells me that is the barrier that makes me feel fatigued. 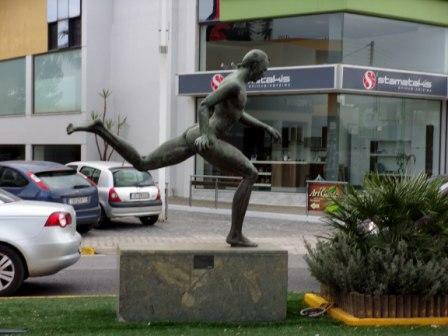 Statue of a runner at km. 21. During the race, not having read about heart rate, just by the feelings I had I decided to forget about the time and continue the climb at a more comfortable pace. With that, the 3h30 and the sub 3h45′ were gone. In the end I completed the race in 3h53’18”, but the profile nor the day (temperatures from 14ºC to 21ºC, on the hot end) were the best to attempt a PR. At the km. 21 there is another statue of an anonymous runner. I crossed the half marathon at slightly over 1h47′, but knowing that the following 10km would take about a full hour and not knowing how I would be for the remainder 11km. The heat of the day called for lots of hydration, and at that point the organization was again terrific, with water posts every 2.5km and with isotonic drinks in most of the posts, plus energetic gels in some of them. One hour later, and having reached the top of the hill I remembered the sentence one of us had read describing the race “from km. 31 you can fly down to the end”. Well, I was not fit for flying. When I tried to speed up I felt muscles starting to cramp, thus I couldn’t run any faster than 5’45”, which I tried to keep, drinking and eating well at each supply post. Once in the centre of Athens, there were still some 3-4 kilometres to cover. I kept myself just for the last kilometre where the atmosphere close to the stadium was great, starting with the descent by Irodou Attikou street. The last turn to the left, climbing up the ramps to enter the Panathinaiko and covering the last meters inside the stadium was overwhelming. One of the best marathon endings I can recall. See in the panoramic below a view of how the stadium looked that day. Panathinaiko stadium panoramic view (picture by Jose). I remembered then when I first visited Athens back in 2002. That time, we visited the stadium and took some pictures as if running in those tracks. Now, 11 years later, there was I, sprinting to complete the Athens Classic Marathon (my 10th), where it all began, no less. Post-race group picture with a great marathon team! Juan, Jose, me and Jaime. “The next time you’re in the USA, run a marathon there”. 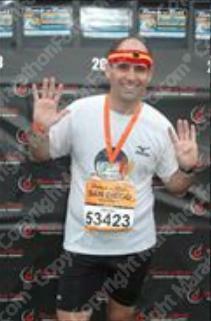 Those were the words from by brother Jaime after he took part in Chicago marathon in 2011. It has taken me 2 years to go back there. This time for my honeymoon. This did not stop me to follow the advice. 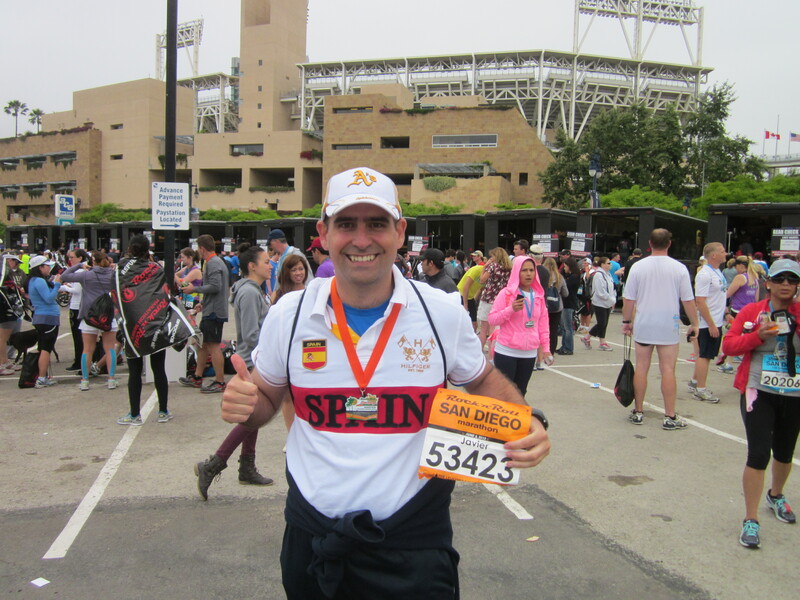 I went through a website with all the marathons in California and found that San Diego Rock’n’Roll marathon was taking place on the very last day of the trip. Perfect! That way the muscle soreness of the following days would not interrupt the tourism activities. June 2nd, the day of the race was only one month and a half after March 17th, when we ran Rome marathon, thus I did not follow any special training plan for this marathon. I just tried to keep the form with which I arrived to Rome by running often, though I didn’t do any series session and only one long run… I paid for that. The atmosphere was very good but only in some neighbourhoods, in others not so many people cheering the runners. Along the road 163, during the steepest (up to 6% along 1km) and longest (about 4km) climb there was almost nobody. Even if the overall profile is a descent I found the course quite tough. The times of the first 3 runners seem to say the same (2h15 for the winner, 20 minutes more for the second…). The other thing that I didn’t like much was the solid or the lack of abundant and varied solid supplies along the course. I thus only relied on my 3 energetic gels and drinks. 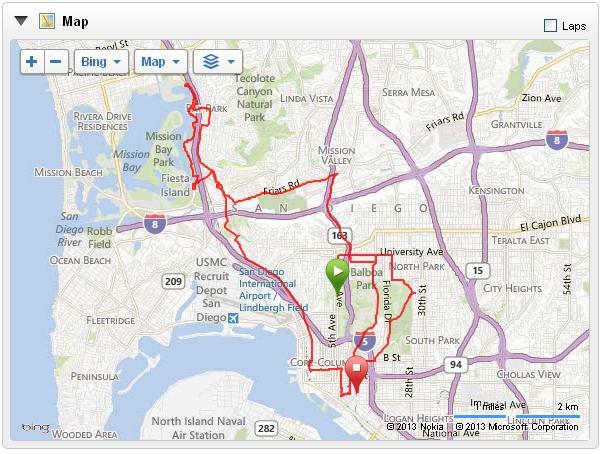 Course of San Diego marathon as recorded by my Garmin. I went quite well at the expected pace (below 5’20” / km) for the first 28 kilometres, then I started to miss endurance and right afterwards the long climb “killed” me. I, however, did not stop and kept running up, if very slow (most of the runners in my time -between 3h45 and 4h- where walking during those kms). I’ve gone through much tougher situations in the last years, thus I only thought “well, slow the rhythm and the climb will finish at some point, keep up”. 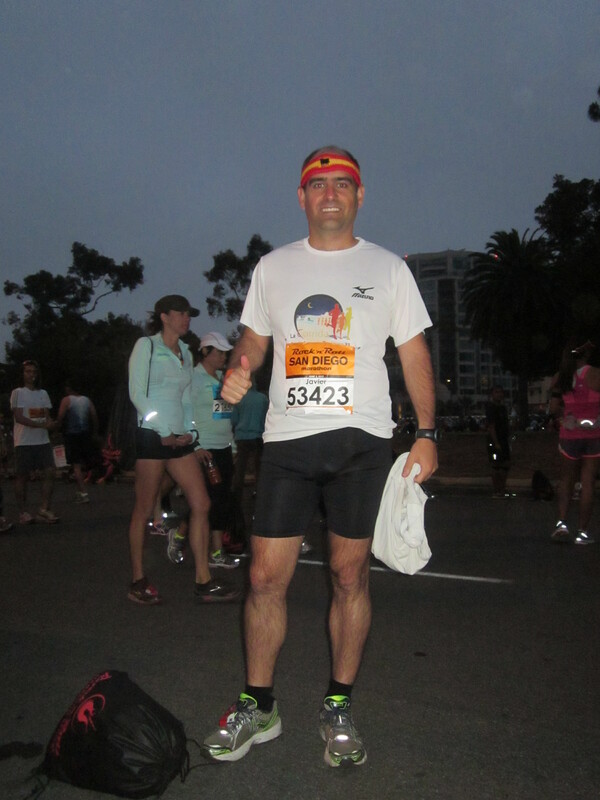 Running at some point of San Diego marathon. In the end I finished in some 3h56’19” as clocked by the official chip (see the report of the race as recorded by my Garmin here). I was happy enough with the result and with having finished the second marathon in the year, another sub-4-hour marathon (the 4th in a row under 4h) and the 9th overall. 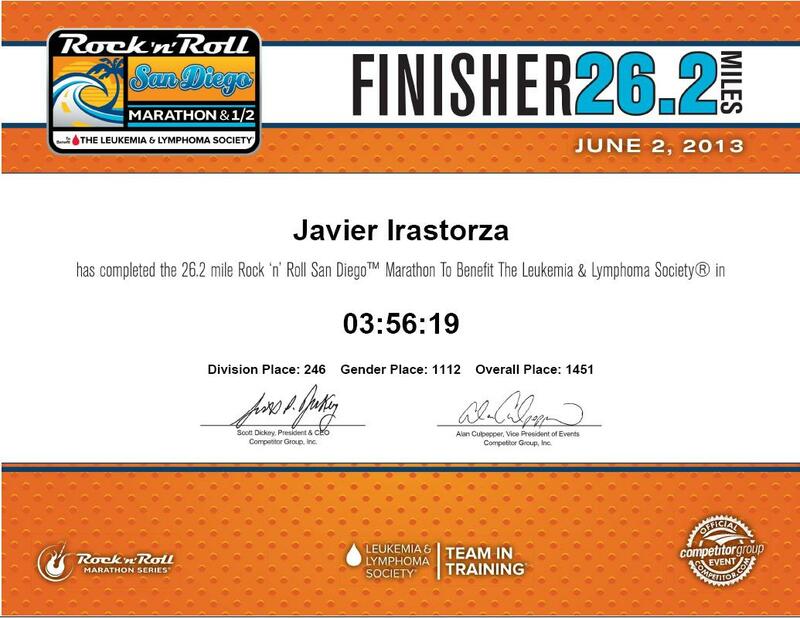 San Diego marathon finisher diploma. Enjoying the feat (behind me: San Diego Padres baseball stadium). 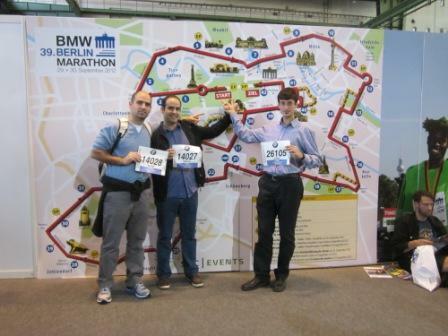 Last September 30th I completed the Berlin marathon together with my friend Serna and brother Jaime. 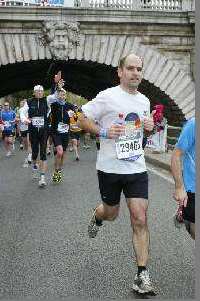 This was the second marathon we ran together (the previous one being Paris 2012). The sixth one I ran. Jose, Jaime and I in the runners’ fair. The morning of the marathon I published a post in which I explained how I arrived at it in terms of training: I suffered an injury about 1.5 months prior to the race which didn’t allow me to practically train during the last month. Previously I had been training well and accumulating many kilometres. 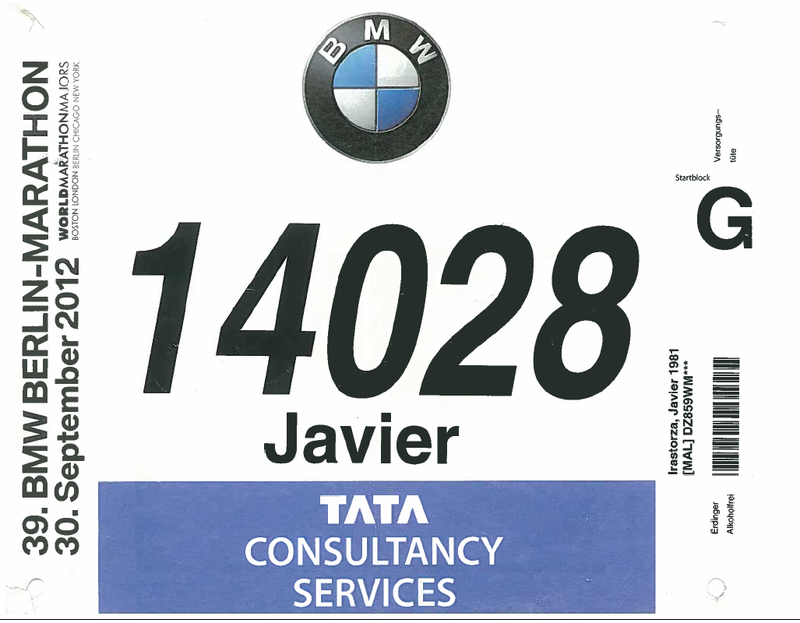 My Berlin Marathon bib number: 14028. 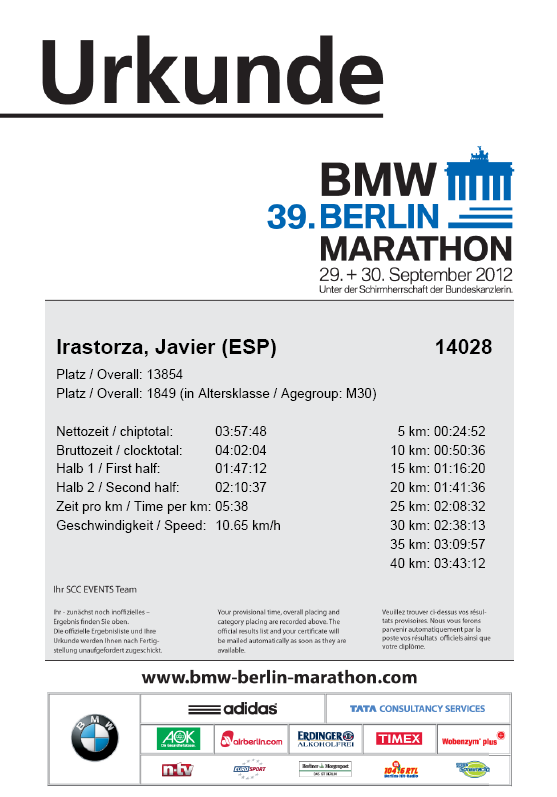 My Berlin Marathon Garmin records. I started with a bracelet with references for a 3h40′ marathon, 5 minutes lower than in Paris. My plan was to start at that pace (5’13” per km) and keep it until I could. I was expecting that I would not be able to run the whole of it and that I would have to walk in case the Achilles tendon was hurting again. If that happened the later it occurred the better. Thus the faster I could go at the beginning the better for having to walk less distance at the end. 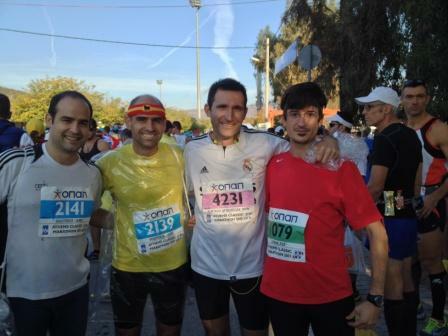 I did the half marathon in slightly above 1h47′, better than in Paris and was still feeling OK. Though at km 23 I started feeling hard to make kilometres under 5’20” (lack of speed endurance work and series in the last month)… I started to think of managing the margin I had built. Finishing the marathon (km. 42). However, 5 kilometres later I started to feel the ankle getting harder and some cramps in the quadriceps of the right leg (lack of kilometres and long runs in the last month). I then decided to slow down, otherwise I would have to start walking soon (when you get these cramps, the following step is feeling the muscle like a rock and not being able to run… experience from marathons 1 and 3). From then on I clocked 6′ per km, then 6’20”, 6’35”, 6’40″… but I was still quite happy as at every kilometre I was making the numbers in my head: “if I keep this pace, I can finish in 3h53′ “, then “3h55′ “… I finally clocked: 3h57’48”, but at all times I knew I could complete it and that I was going to be under 4 hours, thus I just kept on running and smiling. See the analysis of Garmin records by kilometre below. 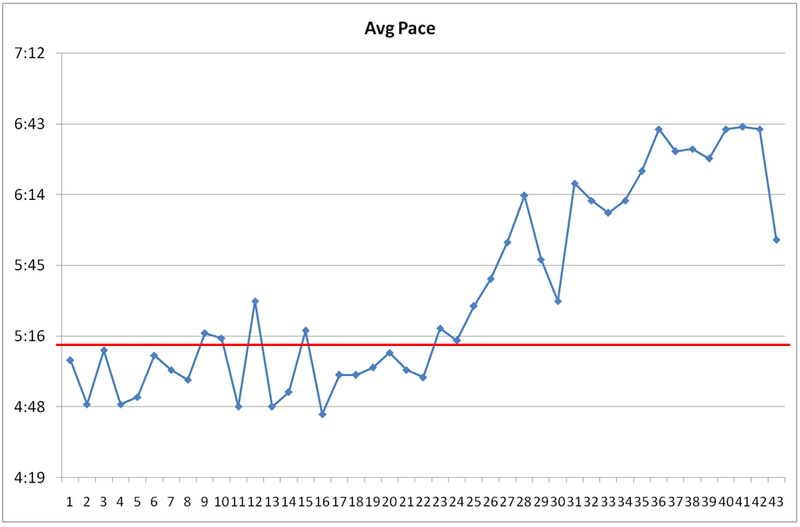 You can see how the pace was at each stage as I explained it above. 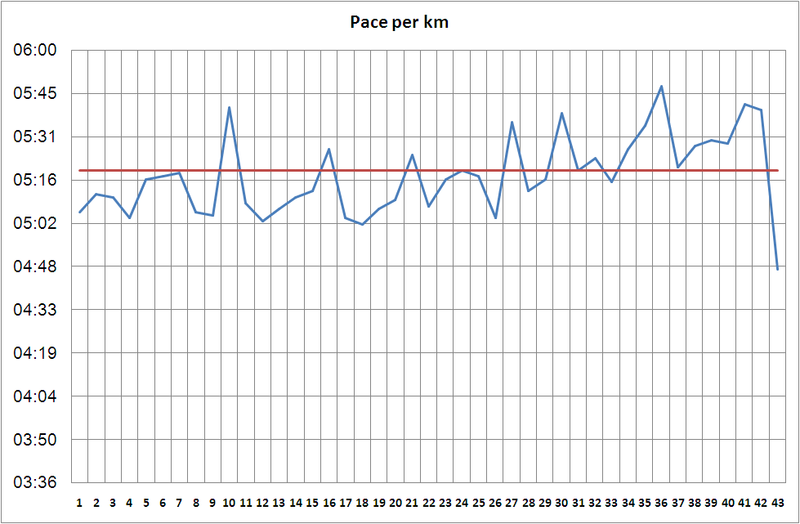 My Berlin Marathon running pace per km (mm:ss). 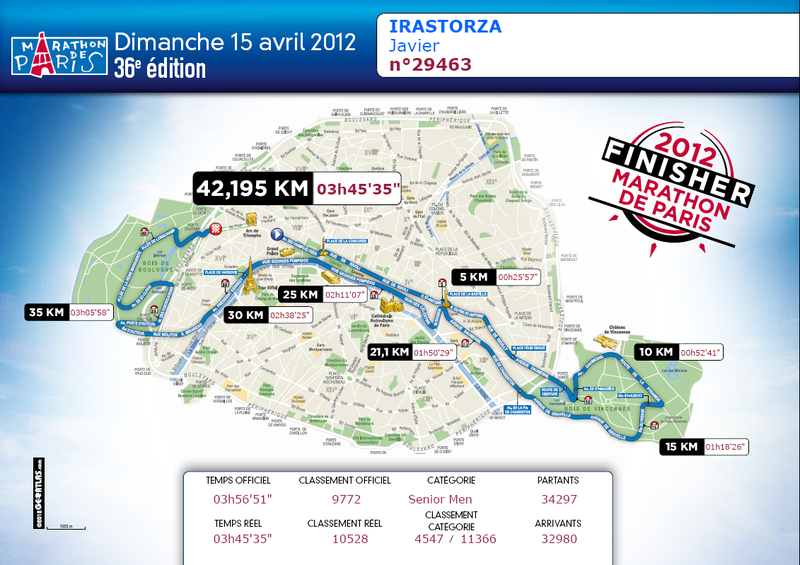 Two more pictures to complete this post: my finisher diploma and the detailed street map of the route. 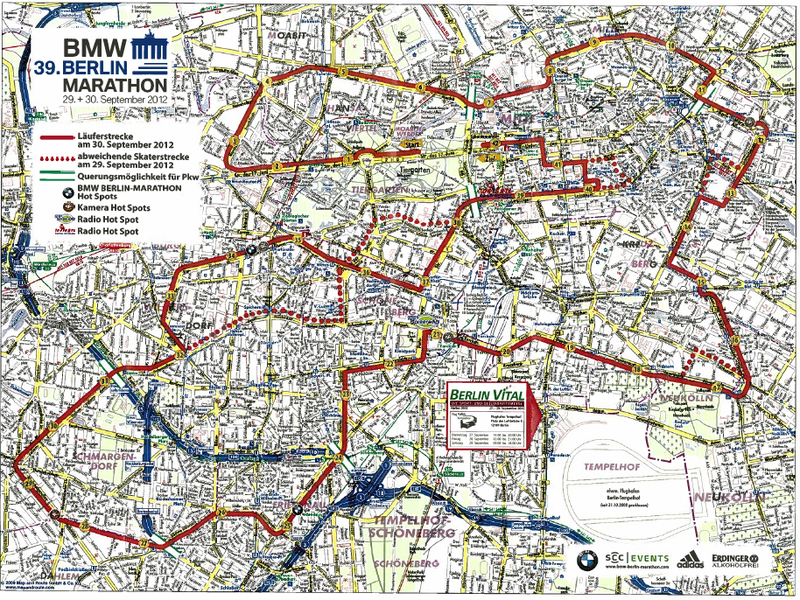 Berlin Marathon detailed street map. Next stop: Maratona di Roma, 17th March 2013. Albi is small city close to Toulouse. It is mainly famous for its UNESCO World Heritage Site Cathedral Sainte Cécile and the museum of the painter Toulouse-Lautrec. I had been there twice, but I hadn’t yet written a post about the city. Today I’ll write about another special feature it has. In Albi there is a car racing circuit. I have a colleague who likes cars, motor-bikes and has been already using that circuit in one of its open days. Yesterday, I wrote a post about the stall exercises we performed in last Saturday’s flight lesson. Let me connect the dots. On Saturday, while having lunch, our colleague told us that the circuit in Albi was having an open day that precise day. He encouraged us to propose to our instructor to fly to Albi. And here comes the catch: “Why?” Because the aerodrome of Albi, our colleague explained to us, is embedded in the car racing circuit! Flight route Toulouse Lasbordes (LFCL) - Albi (LFCI). In the following screenshot of the Visual Approach Chart (carte VAC) you may see how when the circuit IS active the runway of the aerodrome is shortened as the circuit crosses the runway! (You may download the chart here, PDF, 360KB). 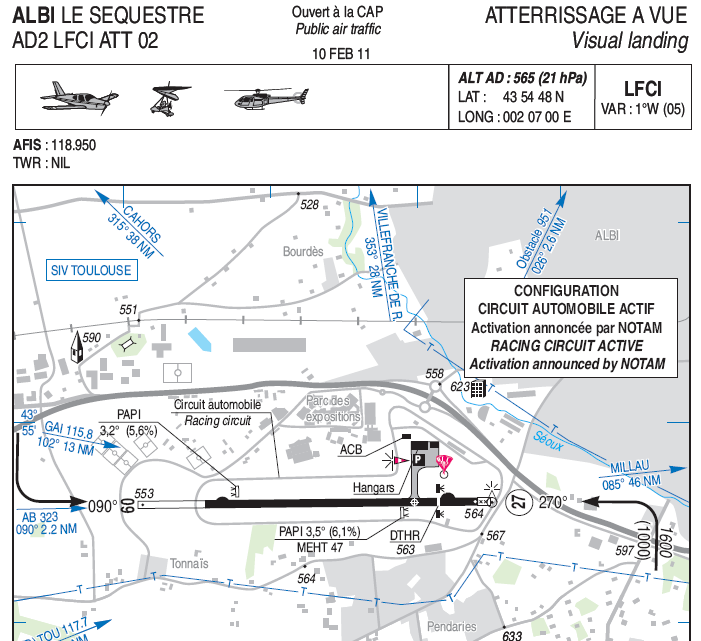 Visual Approach Chart (VAC) for Albi aerodrome when the car racing circuit is active. Albi car racing circuit and aerdrome. About a month ago I started taking flight lessons at the ACAT aéro club, based in Lasbordes, a small aerodrome to the East of Toulouse. I subscribed together with another Airbus colleague and both encouraged by a third colleague who had started some months beforehand. Yesterday in the morning, the weather was not very good so we were not sure whether we would finally fly or not. Nevertheless, we had a theoretical lesson at first hour in the morning so we went to the aero club. At the break of the class, our instructor arrived and confirmed our flight. We took our stuff and skipped the second part of the class and headed towards the Robin DR-42 (F-GNNI) we flew. For this second flight I decided to bring my Garmin GPS, which normally I use for sport activities, in order to record our flight, so that my colleague and I could better know where we had been flying. This will hopefully help us in getting to know better the Toulouse area from the air and with the navigation in the near future. The flight was short and simple: practising pitching up/down, some steady turns and approach. If you click on the map below you will be redirected to the Garmin website where you can read further information about the flight (time of the activity between switching on and off the engine) such as take-off, cruise and landing speeds. Do not pay attention to altitude figures, those reflected by Garmin are the ones of the terrain below (our track footprint). Clarification: as we fly two pupils plus the instructor, each time we perform 2 flights, that is why I was siting at the back when I took pictures during flight.